Matt Allen, director of Technical Art at Shadow of War developer Monolith Productions, talks about Xbox One X development, and the beauty of HDR and 4K resolution. Being part of the Xbox One family, developing for Xbox One X has been fairly easy – something that has been confirmed by various studios, including Forza developer Turn 10 Studios. In a new interview published by Gamesindustry.biz, Monolith’s technical art director talks about adjusting their LithTech engine to take advantage of the Xbox One X’s more powerful hardware. 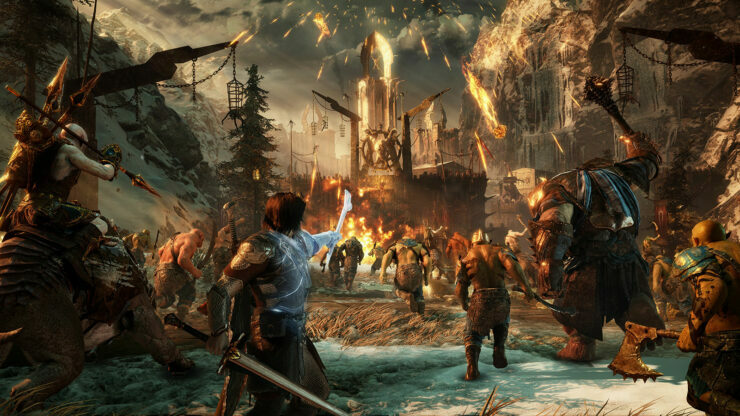 According to the technical director, it took the development team roughly one day to get Shadow of War running on the original Xbox One X [Project Scorpio] development kits. From a content standpoint, it didn’t take long to get it working. From an engineering standpoint, because it shares a lot of DNA with Windows 10 – and we are already running on Windows 10 – it took our engineering director about a day to get it running on the original Scorpio kits. It wasn’t perfect; there were edge cases, so it involved a bit of tinkering, but it was not a lot of extra work. Allen went on to explain that the extra work was involved in adjusting the game’s lighting due to the addition of High Dynamic Range (HDR). The extra work comes in with the extra stuff you can do, like HDR. HDR is a colour space that is sort-of new to games, and a lot of games are using physically-based rendering. We developed PBR in a standard colour range, but when you get into HDR the colour range gets all wonky, because there is so much more… so there was about a month of iteration trying to get the lighting correct. Allen also mentioned the beauty of watching Shadow of War in 4K resolution and HDR. After we have shown the stuff to the journalists, the artists will come in and look at it because they have only seen their stuff in 4K. And seeing it in HDR, they get to see the full gamut of how the lighting affects all of these materials. And you get a row of artists just staring at their work… it’s like they’re seeing it for the first time. When you just see it, and it’s new and you have nothing to compare it to, you think it looks cool. But if you know the content well, it is just so different. And when you have seen it like this, and you go back to the previous version, it just looks dull. We’ve had bugs where they’ve said everything looks a bit grey, but it’s just that they’re playing it in SDR, and they’re used to it in HDR. Middle-Earth Shadow of War will release on Xbox One (enhanced for Xbox One X), PC, and PS4 (with PS4 Pro support) on October 10.